Lawn edger is one of the most significant tools used for the maintenance of the garden. These days, you can find the lawn edger in two different types other than the manual ones. The two different types are electric powered and gas powered lawn edger. While these two make your task extremely easy, they can also pollute the environment to a great extent. That is why, there are many gardeners that stick to the conventional choices such as best manual lawn edger and not pollute the environment. There are technically three prime types of manual lawn edger called spade based, roller based, and hand shears. The spade based are just the spades whose blades are used to cut the edges. On the other hand, Roller based edger either cut like scissors or could have spikes that rotate. Also, the blades in roller based are large that you have to press against the ground. Hand shears are different. They can be double or single handed and also the length can vary. Anyways, you should be certain about your needs and then proceed with the purchase because there are endless options available in the market. You can also read other product reviews such as lawn edger, weed eater, pole hedge trimmer, lawn sweeper, lawn mower, and many more. If you are in search of a lawn edger that is very simple in mechanism and edges the garden effortlessly then this product from Garden Weasel is a considerable choice. It is shaped like a spade with a sharp blade and a foot holder where you have to place the foot and apply force to nip the blade inside and edge the garden. Also, the design is such that it does not harm the grassroots of the lawn. The steel of the spade is hardened and made of high quality that require less maintenance and is durable enough. The 38 inches long stick can help taller people as well. This is a comfortable model with rubberized handles that help in easy holding of the edger. Also, because of the length, the user does not have to bend too much. The ergonomic design of the spade is perfect for people with back condition. Other than just the edging, this tool will also be helpful in breaking the ice from the sideways and gardens in winters. The operation of this tool does not require any special skills. Plus, you will find it really less in maintenance and affordable enough. Next in our list is this commercial grade lawn edger from Bully Tools. This one is a best budget manual lawn edger in our list. This tool is also shaped like a spade with a round edged face and made with hardened steel. The handle and the blade both are made of high quality steel which makes the tool extremely durable. Also, the 12 gauge steel blade will not require a lot of maintenance and it stays far away from rotting and corrosion as well. It requires least amount of maintenance. Now, talking about the handle, the edger has got extremely comfortable rubber wrap handle made of steel as well. You will find holding the spade extremely comfortable and the usage is also convenient. This one also does not harm the grassroots of the garden and carefully does the edging task. The length of 38.37 inches is appropriate for all kind of users, without giving any pain in the back. People with back problem will find the edger really comfortable to use. If you wish to purchase a fine working simple manual lawn edger then this product is a considerable choice. You will find the price really suitable. If you are planning to purchase a simple yet highly durable lawn edger then this model from Radius Garden is a perfect choice to make. The crafting of this tool is done in such a manner that it can be used as a fork, a weed killer, or a shovel as well. So, you can expect versatility from this product as it can handle multiple tasks. The ergonomic design is made of stainless steel which means that you don’t have to worry about the maintenance of the edger. It will stay at a distance from rot and does not lose the edge as well. The round handle provides optimum grip to the hands and also does not slips away when more pressure is applied to the tool. The foot has to be placed at the flat head and pressure is applied to dig the edger deep inside the soil and this edging is done. The length is also appropriate for tall as well short heighted people. Undoubtedly, this one is the top rated manual lawn edger in our list that has been liked by hundreds of buyers. The edger from Truper is a perfect addition in your garden tools. It is lightweight and extremely handy. Plus, it is high in performance when you have to edge the garden. The rotary edger has double wheels for great traction and the cutting edges are made of grey steel which is hardened and extremely tough to serve you for the longest time. The working mechanism of this model is also very simple as you just have to roll it around the edges of the garden and apply force so that it can take out the overgrown grass and weed from the edges. Also, this is better in usage because you don’t have to stop every time before a certain area has to be edged in the garden. Technically, this is a better edger than all others in the list. The handle is made of lacquered ash wood which is durable. Also, you will find the handle decently comfortable. The overlength is 48 inches which is great for tall people but the short ones may find it uncomfortable to hold. The product is made of high quality material and comes with 10 years of replacement warranty from the brand. This edger from Yard Butler is one of the most reliable and heavy duty model in our list. This one is high in weight and a reliable model for all kind of yards. The edger is also shaped like a spade with a footer on the top of the rounded blade that is nipped inside the soil to extract the grass. The blade is rounded and curved to increase and streamline the work flow of the spade. Also, it is made of hardened steel that require less maintenance and holds the edge for the longest. The handle is also made of superior quality steel with a T at the top that is coated with rubber material to make the grip extremely comfortable and firm. About the length, this edger has got 37 inches long height which is suitable for all kind of users without giving any back pains. The efficiency of this edger is commendable and it can give you a perfectly manicured garden in very less time. As far as cost is concerned, this one is available at a decent price as well. This edger from Fiskars is yet another amazing model which has got a simple innovative design. The edging is made easy with this tool. It is shaped like a shovel with a pointed blade and flat upper to place the foot as you use the tool in the garden. High quality steel is used in the construction which runs all the way towards the handle. Also, because of the steel, the durability of this edger is praise worthy. The material is of high grade that can withstand various pressure and temperature conditions as well. The durability of the shovel makes it ideal for all kind of gardens and lawns. The handle is made of wood that can withstand heavy pressure from the user and still not break from between. Basically, the inner body of the handle is made of steel with wooden covers to provide utmost strength to the product. This one is a lightweight manual lawn edger in our list that is first choice of hundreds of buyers. Last in our list is this model from Ames which is an effective and performance rich edger that is suitable for all kinds of gardens and yards. The shape of the edger is much similar to that of a shovel with curved and flat head blade, and long stick handle. The rounded shape of the blade is good in detailed digging and edging of the garden. It is basically in half moon shape with leads to flat head where the user has to place the foot for usage. The construction of the blade is done with hardened steel which require least amount of maintenance and also completely rejects the rotting, rusting, and corrosion. The handle is also made of high quality wood that can withstand the pressure applied on shovel. There is a small rubberized grip end at the handle that make holding of the shovel very easy. If you are looking for a perfect garden tool then this one is an unparallel choice. Just like all other garden equipment, there are some factors that you should consider before buying a best manual lawn edger. You need to follow these factors, especially if you don’t want to waste your money buying something useless. Also, if you want to finish the job quickly and efficiently then finding the right tool is important. There are products available in different prices, material, type, etc. You have to learn all the varieties available in the market to determine your choices. 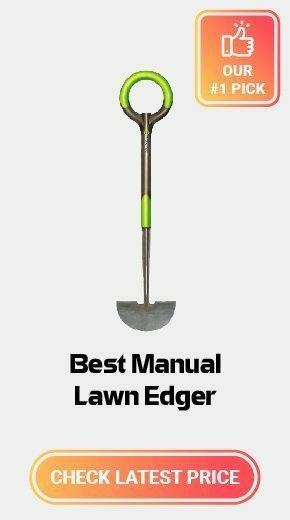 Next in our manual lawn edger review, we will learn about the tips that are significant to find the right tool for your garden. While looking for the best hand held lawn edger, first thing that you should consider is the edging time. Basically, it is the time taken by the edger to edge your complete yard for which, there are various factors that contribute including, size of the yard and model of the trimmer selected by you. A large yard will need more edging time and thus you are recommended to select advanced models of lawn edger for your garden. Manual edger takes a lot of time for edging and it is definitely not suitable for a large yard. On the contrary, you can use it for small gardens or small backyards. You are suggested to buy a product that can deliver full value to your garden. Also, the value of lawn edger must be determined on it efficiency and the time taken to complete the work. A good manual lawn edger should be such that it can be used comfortably by all kind of users. Most of the best ones are available with adjustable height adjustment so that it can suit the height of the user. With every product, the height of the edger is always mentioned. If you are a tall person then you should consider the length of the edger according to your height. This is due to the fact that not all edger comes with height adjustment so you have to be very careful while buying a manual edger. Please be sure that a manual edger cannot be considered without determining the size of the yard. Also, if you want to only buy a manual lawn edger then for bog yards, you will require extremely sturdy and strong models. On the contrary, for smaller yards, an averagely strong model can also survive. The size and length of the lawn will set the purpose of buying a certain kind of lawn edger. Blade type also enjoy major consideration while buying a lawn edger. This is because the blades are the ones that will come in constant contact with the weed. Normally, the blade construction is done with the hardened steel that does not corrode or rust after non-stop usage as well. But the blades are replaceable and once you feel that they have worn out, you can simply bring the new ones and replace with the old ones. There are also some models available in the market with non replaceable blades as well. But such models are available at a cheaper price. You have to be careful while purchasing the lawn edger. The best manual lawn edger is the one that is available with adjustable height settings, have great blade to do the job quickly, and is available at a price that suit everybody’s budget. The list that we have mentioned above comprise of some of the choicest models in the market. These are the edger that customers have liked a lot. If you want to buy a product that is complete value of money then you can confidently pick from our suggestions above because we have done thorough research on each one of them.